On the 24th March 1783 a serious mutiny broke out amongst the English Garrison, the 104th Regiment of Foot. The regiment comprised around 600 Irishmen who had spent the winter in the Citadel at Fort George over-looking St. Peter Port . 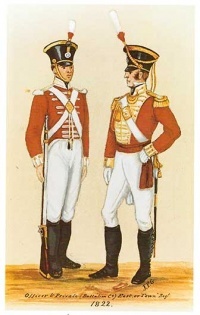 The Grenadier Company of the regiment was garrisoned at the Vale Castle. The Irishmen had caused constant trouble to the people in the country parishes but tolerable discipline had been maintained. However in March 1783 a few discharged men of the 83rd Regiment (Royal Glasgow Volunteers) arrived from Portsmouth and told the Irishmen how they had defied the laws in England. Prompted by this the men in the 104th demanded that the gates of Fort George should be shut and that they should be given liberty to go where they pleased. Furthermore they demanded that, as it was peace-time they should have to do no more duty. Lieutenant-Colonel Irving, granted all then demands which seemed to diffuse the situation. Quiet remained for s few days but on the 24th March, while the regiment’s officers were in the mess-room after dinner, the Irishmen opened fire on them through the door and windows of the building. The alarm was raised in the Town at about 8.00pm It was feared that the Irish 18th Regiment, also garrisoned on the Island at the time, would mutiny in support. However, to their credit, they turned out to face the mutineers. The Militia Artillery and Town Regiments were assembled to help suppress the revolt. The Militia North, South and West Regiments were ordered to patrol their own districts and be ready to turn out if they were needed. At around midnight Lieutenant-Colonel Irving moved the force against the mutineers in Fort George. The 18th Regiment, together with the Grenadiers and Light Company of the Militia Town Regiment, formed a forward line under the cover of a low hedge about 100 yards from the walls of the fort. They were accompanied by four pieces of artillery and two howitzers. Four battalions of the Militia Town Regiment guarded the avenues on one side of the fort and the other four were held in reserve. A summons was sent into the fort and negotiations began. The mutineers declared that they would not lay down their arms and a few shots were fired. Talks continued until around 4am. At one point the Lieutenant-Governor was admonishing some of the deputies from the fort in the field when he and some of his troops were fired upon by the mutineers Fire was immediately returned from the Militia lines. Soon after this the four Militia companies which had been held in reserve were ordered to occupy the high ground on the right of the fort. On seeing that they were surrounded, the mutineers gave themselves up, left the fort and surrendered their arms.